By the release of the Hysteria record, it was apparent that the band had developed a distinctive, futuristic sound featuring heavily processed drums and effects-laden "space-aged" guitar sounds, overlaid with a layered wall of husky, harmonized vocals. Def Leppard are considered a classic example of the rock sound of the 1980s. Def Leppard is one of only five rock bands with two original albums selling over 10 million copies each in the U.S. The others are The Beatles, Led Zeppelin, Pink Floyd, and Van Halen. Rick Savage (bass), Pete Willis (guitars) and Tony Kenning (drums) formed the band (Originally known as "Atomic Mass") in 1977 in Sheffield (see 1977 in music). Joe Elliott auditioned for a spot as their guitarist following a chance meeting with Willis. However, during Elliot's audition, it was decided that he was better suited for the role of lead singer. Soon afterwards, they adopted the name "Deaf Leopard" (which Elliott had thought of in his school days). At the suggestion of Tony Kenning, the name "Deaf Leopard" was slightly modified to Def Leppard in order to avoid comparison to punk bands, and perhaps also as an indirect homage to Led Zeppelin's similarly styled band name. While perfecting their sound as a band in a spoon factory, the band added another guitarist in Steve Clark in January 1978. Kenning suddenly left the band prior to recording sessions for a three-song EP in late 1978. He was replaced for those sessions by Frank Noon on what was known the Def Leppard EP. Sales for the EP soared soon after the track "Getcha Rocks Off" was given extensive airtime by renowned BBC Radio DJ John Peel, considered at the time to be a champion of punk rock and new wave music. 15-year-old Rick Allen joined the band as its full-time drummer in November 1978. Throughout 1979, the band won a loyal following among British hard rock/heavy metal fans, and were even initially considered the leaders of the New Wave of British Heavy Metal (eventually relenting that spot to Iron Maiden). This emerging popularity resulted in a major label record deal with Phonogram/Vertigo (Mercury Records in the US). Their debut album was On Through The Night, released on March 14, 1980. Although the album hit the Top 15 in the UK, many early fans were turned off by an inaccurate perception that the band was trying too hard to appeal to US audiences, with songs like "Hello America" and touring more in the US (supporting Pat Travers and Ted Nugent) than the UK. This hostility was highlighted at the Reading Festival in August, where audience members pelted the band with garbage during their set. In retrospect, the hostility was unfair because the band was only taking advantage of opportunities not given to most young British rock bands at the time. However, the damage was done and it would take a while until Def Leppard won back their homeland fans. The band then caught the attention of AC/DC producer Robert John "Mutt" Lange, who agreed to work on their second album, High 'N' Dry. Lange's painfully meticuluous approach in the studio greatly improved on Def Leppard's potential from On Through The Night. Despite mediocre album sales, the "Bringin' on the Heartbreak" promo clip became one of the first "metal" videos played on MTV in 1982, and this brought increasing visibility (and momentum) to the band in the States. Phil Collen, former guitarist with the glam band Girl, replaced Pete Willis who was fired on July 11, 1982, due to excessive alcohol consumption on the job (Willis later resurfaced with the bands Gogmagog and Roadhouse). This personnel change took place during the recording of their third release, Pyromania, released on May 20, 1983, which was also produced by Lange. The song "Photograph" turned Def Leppard into household names, knocking off Michael Jackson's Beat It as the most requested video clip on MTV, and becoming a staple of rock radio (dominating the US Album Rock Charts for six weeks) while hitting #12 on the pop charts. Fueled by "Photograph" and subsequent singles "Rock of Ages" and "Foolin'", Pyromania went on to sell six million copies in 1983, then going to sell ten million copies in the U.S. in 2004, and was held off the top of the US album charts only by Michael Jackson's Thriller. The album has since been certified Diamond by the RIAA in the US, and is considered both a classic in both the mainstream rock and heavy metal genres. Def Leppard's US tour in support of Pyromania began by opening for Billy Squier in March, and ended with an audience of 55,000 at Jack Murphy Stadium in San Diego, CA in September. As a testament of the band's popularity at the time, a US Gallup poll in 1984 saw Def Leppard voted in as favorite rock band over peers such as the Rolling Stones and Journey. Conversely, the band could not be any less popular in their native UK, a fact that greatly bothered them. Following their big break, the band moved to Dublin, Ireland in 1984 to begin writing for the follow-up to Pyromania. Mutt Lange initially joined in on the sessions, but declined to return as producer due to exhaustion. Instead, Jim Steinman (Meat Loaf), was brought in. The Leppard-Steinman pairing was a disaster, as Steinman's production ideas were totally at odds with those that Lange had instilled in the band. This quickly led to his being fired, with Lange's assistant Nigel Green taking over, with no more productive results. On December 31, 1984, tragedy first struck the band when Rick Allen lost his left arm in a car crash on the A57 outside Sheffield when his speeding Corvette veered off the road into a concrete wall. Despite the severity of the accident, Rick was committed to continuing his role as Def Leppard's drummer. He practiced drumming with pillows, and realized that he could use his legs to do some of the percussive work previously done with his arms. He then worked with Simmons to design a custom electronic drum kit. The other members of the band were totally supportive of Rick's decision, and never sought a replacement. During his recovery, Mutt Lange eventually returned to the fold as producer, and Rick's triumphant comeback was sealed at the 1986 Donington Monsters of Rock festival, with a emotionally charged ovation upon his introduction by Joe Elliott. Def Leppard's fourth album, Hysteria, was finally released on August 3 1987. The first single from the album, "Animal", reached #6 in the UK and finally made the band into stars in their home country. Hysteria immediately topped the charts in its first week of release. US album sales were relatively slow (compared to Pyromania) until the fourth single, "Pour Some Sugar On Me", was released. Already a favorite at the band's live shows, the song became the band's first US Top 5 hit (reaching #2), and the video was #1 on MTV's countdown show "Dial-MTV" for a near-record 68 days. A full year after its release, Hysteria went to Number One on the US Album Charts in the summer of 1988. In October, the power ballad "Love Bites" became Def Leppard's first (and only) Number One single on the Billboard Hot 100, and in January 1989 the band scored another US Top 5 hit with "Armageddon It". Hysteria is one of only a handful of albums (and the third in rock history) that has charted seven singles or more on the US Hot 100: "Women" (#80), "Animal" (#19), "Hysteria" (#10), "Pour Some Sugar On Me" (#2), "Love Bites" (#1), "Armageddon It" (#3) and "Rocket" (#12). It remained on the charts for three years and has sold over 12 million copies in the US alone. An historic world tour followed the release of Hysteria. Seeking to impress fans who had been waiting four years for the band to return to the road, they opted to perform "in the round." A large stage was placed in the center of each arena, with Allen's drum kit at the center, allowing concert attendees a virtually unobstructed view of the band. Coupled with an elaborate laser light show, the tour quickly became one of the highest grossing of 1987, 1988 and 1989, when it finally closed. During the drum solo section of the show, Elliott would rile the cheering crowd as a tribute to Allen's resilience as the band's drummer. Rumors of wild backstage antics involving groupies during these nightly interludes were later confirmed in the band's VH1 retrospective documentary, Behind the Music by interviewees and Ross Halfin, a rock photographer who traveled with the band through much of the tour. By decade's end, although contemporaries like U2, Guns N' Roses and Bon Jovi garnered more mainstream exposure, Def Leppard was in fact the best selling rock band of the 80's. After Hysteria's mammoth success and tour, the band quickly set out to work on their fifth album, hoping to avoid another lengthy absence between albums. However, Steve Clark's alcoholism worsened to the point where he was constantly in and out of rehab. Recording sessions suffered from this distraction, and in mid-1990 Steve was given a six-month leave of absence from the band. Sadly, this culminated in Steve's death from an accidental mixing of prescription drugs and alcohol on January 8, 1991. The other band members decided to temporarily carry on as a four-piece, with Phil playing Steve's intended guitar parts. Def Leppard's fifth album Adrenalize was finally released in April 1992. The album simultaneously entered at Number One on both the UK and US album charts, staying there for 5 weeks on the latter. The first single, "Let's Get Rocked", was an instant smash hit and the accompanying video was later nominated for Best Video of the Year at the 1992 MTV Video Music Awards. Adrenalize yielded a total of six hit singles around the world. However, the rise of grunge in 1992 began to eat into the popularity of more established rock groups. Although Adrenalize sold 5 million copies in the US, it did not have the chart longevity of its two predecessors. In addition, many fans saw the album as a weaker, lighter version of Hysteria. Mutt Lange, who had co-written all but one of the tracks, was credited as executive producer for Adrenalize. In April 1992, accclaimed hard rock guitarist Vivian Campbell joined Def Leppard. Campbell had previously been in Sweet Savage, Dio, Whitesnake, Trinity, Riverdogs, and Shadow King. Shortly afterwards, he made his live debut with his new band at the Freddie Mercury Tribute Concert, held at Wembley Stadium. Def Leppard performed three songs: "Animal", "Let's Get Rocked" and Queen's "Now I'm Here" (with Brian May). In the second half of the concert, Joe Elliott sang another Queen song, "Tie Your Mother Down", with the surviving Queen members and Slash of Guns N' Roses. A collection of b-sides and unreleased tracks recorded between 1984 and 1993, Retro Active, was released in October 1993. It was preceded by the chart success of the acoustic ballad "Two Steps Behind", originally featured in the Arnold Schwarzenegger film Last Action Hero. Another Retro Active acoustic ballad, "Miss You In A Heartbeat", hit the Top 5 in Canada, becoming one of the band's biggest hits in that country. Two years later, the band issued its first greatest-hits collection, Vault: Def Leppard's Greatest Hits (1980-1995), which would go on to sell over 2 million copies. The compilation included a new track, the ballad "When Love & Hate Collide", which became their biggest ever hit in the UK, hitting #2. However, in a reversal of fortunes, the single did not hit the Top 40 in the US. The next Leppard album, the first on which Campbell would actively collaborate in the songwriting and recording, was Slang, released in 1996. Slang was a drastic musical departure from their traditional hard rock, melody-heavy sound, and had an altogether darker and grungier feel. While the album was not well-received by most fans, Q Magazine would feature it on their list of Top Ten Albums of 1996, and it is still one of the band's favorite albums. Just when the 90's seemed to mark the beginning of the end for Def Leppard, VH1 revived the band's fortunes in 1998 by featuring them on one of the initial episodes of Behind The Music. The documentary, including interviews with past and present members, told of their compelling tale, and renewed interest in the band in the US (although they still had strong fan bases in Canada, Japan, and the UK). The episode remains one of the most popular in the Behind The Music series, and was even parodied on Saturday Night Live. Also in the meantime, the spoken line intro from "Rock Of Ages" was now being heard on The Offspring's Pretty Fly (for a White Guy), the biggest hit single of their career. Next came the album Euphoria in 1999. The first single, "Promises", reunited the band with former producer Mutt Lange, and hit the top of the US mainstream rock charts for three weeks. Another track, "Demolition Man", also featured guest guitar work from Formula 1 World Champion Damon Hill, a fan of the group. The return to the classic Def Leppard hard rock sound proved a hit with both fans old and new as Euphoria was quickly awarded for gold sales over 500,000 units in the US. In 2001 VH1 produced and aired Hysteria - The Def Leppard Story, a biopic starring Orlando Seale as Joe Elliott, Tat Whalley as Rick Allen, Anthony Michael Hall as Mutt Lange and Karl Geary as Steve Clark. The movie covered the band's history between 1977 through 1986, from formation to the tragedies of Rick Allen's accident and Steve Clark's battles with alcoholism to Rick's triumphant comeback. It was broadcast that summer to some of the channel's highest-ever ratings. The movie was subsequently released on DVD in January 2005. Def Leppard's tenth album, X, was released in July 2002. It saw the band's musical direction moving more towards pop and further away from the band's hard rock roots. In fact, some tracks were written and produced by people who'd worked with Britney Spears and the Backstreet Boys. 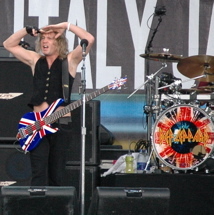 The first single from the album, "Now", featured a video depicting the "adventures" of a classic Def Leppard Union Jack shirt between 1983 and 2002. Although it was greeted with generally positive reviews, X quickly disappeared from the charts and is the worst-selling album of the band's career. However, the accompanying tour played to the band's strongest audiences since the Adrenalize period. An expanded and updated greatest-hits CD, Best Of, was released in October 2004 around the world. The North America-only version, renamed Rock Of Ages - The Definitive Collection, was released on May 17 the following year. The compilations went platinum in Canada, the US and the UK. In 2005, Def Leppard participated at the Live 8 show in Philadelphia, and toured baseball stadiums with Bryan Adams in the summer. The year also saw the band leave their longtime management team, Q-Prime, to sign with HK Management (Aerosmith, Lenny Kravitz). For 2006, Def Leppard is set to release an all-covers album titled Yeah! on May 23. The set pays homage to some of their teenage musical heroes, with songs originally performed by David Bowie (Drive-In Saturday), The Kinks (Waterloo Sunset), The Nerves (Hanging On The Telephone), Electric Light Orchestra (10538 Overture), among others. Def Leppard is also set to embark on a summer tour including headlining various rock festivals in Europe as well as an amphitheater tour with Journey in the US. Along with KISS, Queen, and Judas Priest, they are scheduled to be the inaugural inductees on the "VH1 Rock Honors" show, to be broadcast on VH1 May 31, 2006. Def Leppard is a British rock band from Sheffield, England, that formed in 1977 as part of the New Wave of British Heavy Metal. Thanks to their classic albums, 1983's Pyromania and 1987's Hysteria, Def Leppard became the top selling rock band of the 1980s. The music of Def Leppard is a mixture of hard rock, glam rock, AOR, and heavy metal elements. The band has occasionally been associated with the pop metal movement of the 1980s, although its sound is more accurately associated with the contemporary NWOBHM genre of the late 1970s. The band's songs generally feature simple guitar hooks and catchy, melodic choruses. The Def Leppard sound is also characterized by its combination of pop rock and polished melodic backing vocals. This approach is very much evident on their first international single, "Hello America", which blended the backing vocal style of Queen, with the guitar crunch of Thin Lizzy.